We spoke to the Isle of Man's Minister of Tourism and Leisure David Cretney to get the latest information about the Governments plans about the future of the TT and the current Foot and Mouth situation in the UK, which could have a dramatic effect on the races. I have to ask you first of all about the foot and mouth saga. What is the latest news? In terms of implications on the TT, we have seen what has been going on in the UK and I was particularly concerned when I saw Nick Brown two Sunday's ago saying that it could be up to two months before the situation eases. That was the first time I had heard an actual timescale. I still hope that they get the situation under control in the UK; I don't think they have at present. Some people think that things like the army being brought in should have happened earlier, but it's all speculation, and I don't know if anybody could have known that the situation could have spread as quickly as it has done. So our position remains the same. We have to monitor the situation daily and at the same time have a subtle contingency plan, which we have always had. We have plans in the background should the TT not go ahead at the scheduled dates. However, due to the fact that other bike events going on around the world, and other sporting events in the Island, finding a date is not without it's problems. Then there is a problem with the Steam packet of course, because their fleet after the traditional TT dates is depleted, and if we were to look at an alternative date, they would have to look at hiring in additional vessels to meet demand. We have also heard that even if the races don't go on, many people are still going to come. I was going to ask you about that very fact actually. If that was to happen do you not think that cancelling the TT would be defeating the object? The concern with all the events is what goes on in the countryside. I had naively perhaps thought that with very strict co-operation from my Department and the Department of Agriculture, that a number of areas around the course could be 'no-go' areas for this year. One of the attractions of the TT is being able to get close to the action. But I thought that we could have these 'no-go' areas, with just the marshal's in their correct positions and that visitors would fully co-operate rather than destroy the races completely as suggested by others. When I made that suggestion, and the way it was taken out of context, and people missed the point that I do care about the agriculture implications as well. From this there has been a lot of comment and uninformed criticism of what I actually said, which I have tried to clarify since. What we are trying to do all along is the best for the Isle of Man and the Chief Minister has said on a number of occasions, that we must try to seek a balanced view. We could close the Island down, but that wouldn't be acceptable. People are coming to the Island day to day on business, but we do have restrictions in place, and a disinfections regime, which I had hoped could be stepped up for the TT, but it would seem that some people consider that wouldn't be sufficient. Now going back to your original question, we have been contacted by people who have made arrangements and who are still coming over. If the restrictions are still in place at that time, they won't be able to visit the countryside, but I am sure we'll try and put activities on the promenade and other town areas away from the countryside, even if we don't have racing. How likely is it now that the TT is going to be cancelled? I appreciate it is helpful to make a decision as early as possible, however we have got until, the week commencing the 20th of April to make a final decision, but I do appreciate that people would like a decision before that. We are meeting with the ACU and the manufacturers next week to see what their views are on the possibilities of a contingency plan being brought into place. I am also meeting many representatives of all the facets of the tourism industry. I know, I'm looking for gossip really! If it is cancelled what effect do you think it might have, on the future running of the event? I get mixed feelings about this. Some people say that the those people that are against the TT, would be able to get it stopped in the future if we cant run the TT this year in June or put a contingency plan in place, which I think is desperate. I don't think that this would be the case. I know how many people love the event world wide, the riders love to come here to race, to this on off, unique event and I'm sure that as long as these people want to do that, we can make it available for them. David, you are the Isle of Man Minister for Tourism and Leisure and are responsible for the organisation of the TT. Can you briefly explain what your role with regards to the TT entails? I chair the TT co-ordinating committee, which comprises members of the department and members of the ACU. We meet regularly throughout the year to discuss issues relating to the TT. We also meet the manufacturers normally twice a year. We also have a presence at the various motorcycle shows were we have the opportunity to have a riders forum to get feedback from the riders to make sure we are doing what is right for the future of the event. Now you are obviously a bike-racing fan, and as many people know, you raced yourself. Tell me about your own racing days? 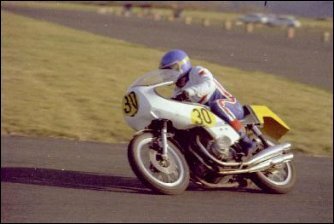 I started racing in the Manx, and the Southern in the mid 1970's and obviously I did the Andreas meetings, and I had raced at Cookstown and other places in Northern Ireland. I went away to Northern Ireland with Ronnie Russell and we were very fortunate to have the late Frank Kennedy helping us, by showing us the courses when we went away. 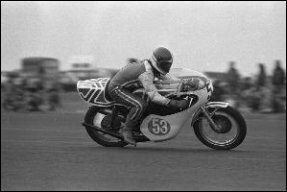 He was very helpful and he then came over here about that time along with Raymond McCullough, Joey Dunlop and others. As you know I went quicker than I had done before in 1998, but the bike was so much better than anything I had raced before. It was a bog standard CBR 600 Honda and compared to when we first started, where we would be up all night with friends trying to get a Yoshimura Honda to actually run on four cylinders and not run too rich etc. You couldn't really concentrate because you were that worried about trying to get the thing to go, but nowadays, they are so fast and so reliable, they handle well, they brake well; you know it's just much more fun like that. Do you think that your own involvement in that way helps you with your duties for the TT and Manx Grand Prix? It can be a help and a hindrance, because I know sometimes I am accused of being to close to the sport. But I honestly think it has been a help, and I have lots and lots of friends because of it, and I am one of the patrons of the marshals association amongst other things like that, so it's nice to have that relationship, and people know they can come to me with their comments. I know I won't be able to please everyone all of the time, at least they have the opportunity to voice their opinion. I have always said that I am open to suggestions with regards to the running of the event, so please let me know. I would also say to people that the safest way to ride a bike fast is to get a competition license and do it in a controlled area rather than going too fast on the roads, a message I write every year in the TT programme. I have lost too many friends from riding bikes too fast on the roads. Since taking up your post as the Minister for Tourism and Leisure, many people have remarked at the success some of the new TT activities outside of the racing have achieved. Was this something you have worked hard at? Yes. I think to be fair, that started before my time in this position, but we have tried to build on that, not only on Mad Sunday, but right throughout the fortnight for the visitors and the locals of course. I know the vast amount of locals love the TT and mix and mingle with the party atmosphere and the racing. Those who don't, normally let out their houses and go and take their vacation, which is fine also, because accommodation is the real pressure point as far as the races is concerned. But yes, as far as the carnival side of things is concerned, I think it is a wonderful, world-class event to tell the world about which we will continue to do so. As we all know, Joey Dunlop was killed racing in Estonia this year. You were in charge of dealing with all the implications on the Island after his death, and I would like to congratulate you on a job well done. How hard a task was it? It was perhaps one of the hardest things I have ever had to do. I like many others felt that Joey was somewhat invincible, and that nothing like this would ever happen to Joey. I was out on Sunday the 2nd of July, then when I got home I was inundated with telephone calls. By the next morning I'm on the radio at 7:15am on Good Morning Ulster saying how the Isle of Man had been shocked by his death. There was continued contact from around the world for a long time afterwards and then we had to decide how to properly honour Joey for what he had done for the Island over all those years. I think the Island did this collectively in a proper way. I was asked to read a scripture at the funeral, which isn't something that comes natural to me, However, I was honoured to do so, in the presence of sports ministers from the UK, Ireland, North and South, and here I am from the Isle of Man being asked to say some words, which I thought was such an honour and a privilege on behalf of the Isle of Man. What I have tried to do since then, is to build on those links with Northern Ireland in particular, because we have this common bond in terms of Road Racing, and Joey was so important to the people of Ireland and the Isle of Man for what he did in the sport and outside of the sport, which touched so many people. It was something I never anticipated doing, but since then many people have contacted me and said that they appreciated what I did, which is very nice. How much of an impact do you think his absence will have on the future of the TT? As we all know Joey would want racing to continue. Shortly after the incident there was a situation at the Ulster where many comments were being made, especially after several other riders had been killed, but the riders turned up to race, as I knew they would, because they want to participate in Road Racing. Joey would want us to continue here, and I intend to see to that. With regards to the effect on spectators etc, I don't think that any effect will be noticeable this year because clearly there are going to be people who want to come to the first TT without Joey. However, we need to really double our efforts in terms of the future of the event, to ensure its future. You are involved with The Joey Dunlop Injured Riders Fund, which I think is one of the most worthwhile motorcycle charities there is. Can you tell us what the latest information is regarding the charity? Yes I am pleased to be involved with this. I felt at the Grandstand in terms of the facilities for disabled people, not just injured riders, weren't adequate. That view coincided with Barbara Wood who is very close to a number of riders who aren't able to get about now, some of which are in wheelchairs. The Department is funding the lift, and we have worked together to ensure what is put in place meets the needs of the people who are going to come to the event. You have to hand it to Barbara; she's done a brilliant job with the charity so far? Yeah, absolutely. She's a little dynamo. OK, let's talk about the TT itself now. First of all it has been highlighted that TT funds are given to manufacturers rather than teams. In this day and age when there is no real manufacturer directly involved in running riders at the TT, do you not think that the rule should be changed? I do believe the time is due for us to consider ongoing support with manufacturers and the other teams who might not be closely associated with manufacturers, and I think we need to make progress with finding assistance for them. They put on a very professional show, and I think that is the next logical step, that we at the Department can make. We have tried to increase the travel support, however, when you look at the amount of money Paul Bird and the other teams like his lay out, and the professional approach they have, I do think it is a logical step. It is certainly not something we have ignored. We try and do things in a structured way. We have increased the prize money and we have increased the travel money and I think the next logical step is to increase the money for these teams, even if it is perhaps not as much as they would like, but to increase it for them to begin with at least. Last year the Singles race was very poorly supported with only about six finishers. How do you see the future of that race? We were encouraged to have the singles race here on the basis that it was an upcoming class in Europe etc. it hasn't really worked out as we had envisaged although there has been some real hero's in the class, like Dave Morris in particular who was fabulous. However, I guess we'll be looking to make sure we have the right make up of events in the future, and being totally honest, which I would always want to be, you couldn't help but say that the Singles Race is the one that is the weakest. Have you ever considered swapping it for a forgotten era class, which is very popular on the mainland? Yeah, I mean I've watched Brian Kneale for instance on the RG and he's fabulous and the bikes are great. So what we've tried to do with the Classic event being introduced to the Manx Grand Prix in 1983 we felt that if we were to introduce a Forgotten Era event to the TT, I guess the consideration would be that we might be taking away something from the Classic racing at the Manx and we would not want to weaken that great event. It is certainly worthy of consideration and I will make sure the TT Co-ordinating Committee has that point on their agenda, but as I say, it needs much thought. What else could you run? Well some people would say that we are already running too many races as it is. Some people say that we should use the extra time for practising, which is another idea that has been put about. The one thing I have thought about is having two 600 races, because at the moment, the 600 class is the most competitive, with the most starters and the most finishers? Yes well that has been spoken about. I think that will be up for consideration again after this year. One of the things we were talking about was a two-leg affair. But yes I agree with you, as things stand the 600 race is certainly a really exciting race, with lots of the bikes being on a par with each other which makes for good racing. It is certainly the class of today? The TT prize money has been increased for this year's event but some people would argue that the money is not ideally distributed. What would you say in response to these claims? Well obviously, because I'm party to that decision, I would disagree. As far as I'm concerned the Formula One and The Senior are still the main events of the meeting, and I think it is right that they should carry the most prize money. Across the other classes, although the increase has been more modest, we have tried to put something in them all. If you are to compare this sport with other sports, you find that the riders are competing because it is something they want to do, rather than doing it for the money. I think if you are to look at the TT and any other part of Motorcycle racing, the money we have available is better. 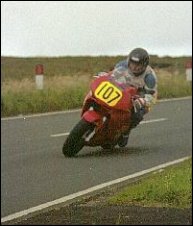 From last years stating line up, several top TT names will be missing in 2001 should the event go ahead, including Joey Dunlop, Gary Dynes, Darren Lindsay, James Courtney, Uel Duncan, Michael Rutter, Blair Degerholm and maybe even Jim Moodie. I realise that the reasons for this are out of your control, but is anything being done to replace this calibre of competitor? We have tried several initiatives, particularly the one involving the New Zealand riders, and we always make an effort to meet the rider's needs. However, with the TT, the rider has to want to race here first of all, because if he is only coming here for the monetary aspect, then it that is not what we want. I agree with what you say about the riders that might be missing from the grid, and as we all know, last year was a particularly bad year for the sport in general, however, there are still a lot of good young riders coming through, with the likes of Adrian Archibald who is the fastest 600 class rider ever around the Mountain Course, Ryan Farquhar and others. I'm sure it will go on. 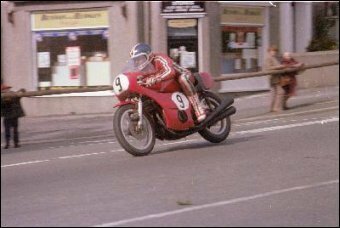 The Manx Grand Prix is also producing many good new riders and the Mike Hailwood foundation has also been a great help with introducing potential star riders to the Island. With regards to the TT organising Committee, how would someone like myself for instance, who is young, enthusiastic and I would hope knowledgeable about the TT, get involved in some way? In the TT programme every year I try to make it known that I am always open to suggestion for ways to improve the TT. I would not say that it can't be improved, and we are always looking for ways to improve it. With regards to the TT Co-ordinating Committee, there is a proper formula for its composition between the Isle of Man Government and the ACU, but for someone like yourself, if you were able to put the views aired on the web site for instance, into a formal sort of approach, they could and would be looked at by all means. Finally, a couple of quick TT questions. Who is your all time favourite rider? (Laughs) Err, Mike Hailwood. It has to be Hailwood for me, but I would also put Joey on a par with him. They were two great riders and wonderful persons away from the racing also. Rhencullen. Definitely. I have a lot of friends who Marshal out there, and I try and Marshal when I can as well, but it's hard with my official duties to consider. I do prefer to get out on the hedge in amongst the action if I can, and Rhencullen is certainly my favourite vantage point. Favourite part of TT fortnight? Just getting out on the hedge to watch people going fifty miles per hour faster than I would normally do at the same spot (laughs). Well thank you for taking the time to talk to me, and best of luck with the difficult decisions you have to make. Thank you very much. It has been great speaking to you.